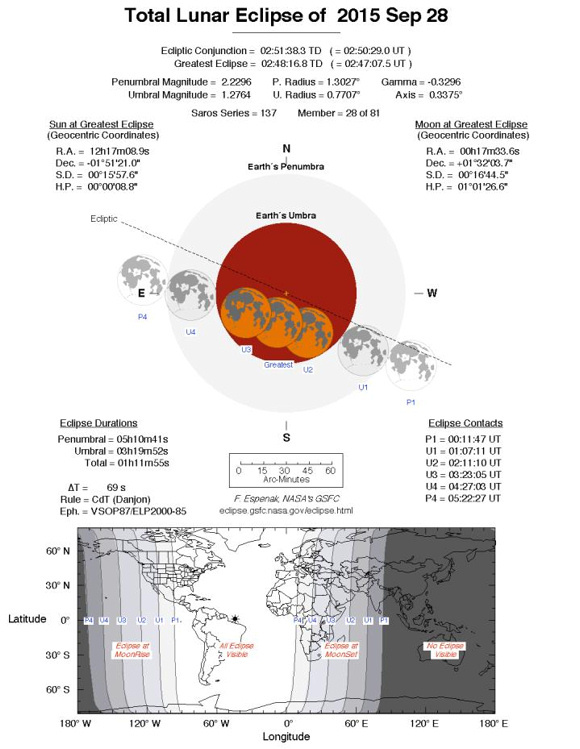 When and how to watch the September 27-28, 2015 total eclipse of the moon. There is a total eclipse of the moon on the night of September 27-28, 2015. It happens to be the closest supermoon of 2015. It’s the Northern Hemisphere’s Harvest Moon, or full moon nearest the September equinox. It’s the Southern Hemisphere’s first full moon of spring. This September full moon is also called a Blood Moon, because it presents the fourth and final eclipse of a lunar tetrad: four straight total eclipses of the moon, spaced at six lunar months (full moons) apart. Phew! The total lunar eclipse is visible from the most of North America and all of South America after sunset September 27. From eastern South America and Greenland, the greatest eclipse happens around midnight September 27-28. In Europe, Africa and the Middle East, the total eclipse takes place in the wee hours of the morning, after midnight and before sunrise September 28. A partial lunar eclipse can be seen after sunset September 27 from western Alaska, or before sunrise September 28 in far-western Asia. Photo top of post shows a partial phase of the April 14-15, 2014 total lunar eclipse by Fred Espenak. Follow the links below to learn more about the 2015 Harvest Moon and the September 27-28 total lunar eclipse. When is the September 2015 moon exactly full? Who will see the September 27-28 total lunar eclipse? Who will see the partial lunar eclipse? Eclipse times in Universal Time. Eclipse times for North American time zones. How is the Harvest Moon different from other full moons? 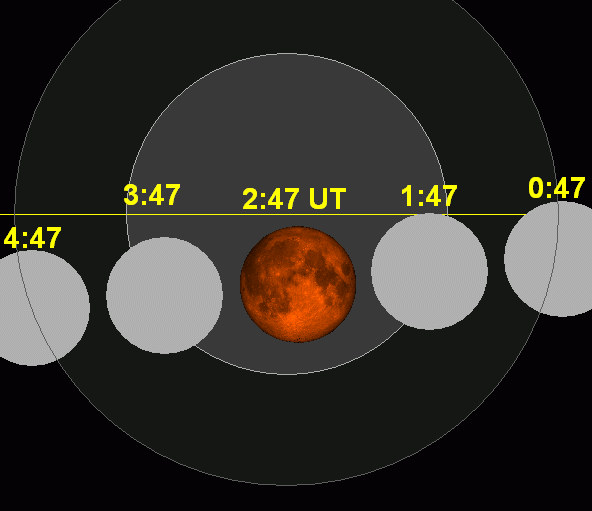 Animation of the September 28, 2015, total lunar eclipse. Moon passes through southern half of the Earth’s shadow from west to east. Horizontal yellow line depicts the ecliptic – Earth’s orbital plane projected onto the dome of sky. The inner bull’s-eye shadow depicts the umbra (dark shadow). The penumbra (faint shadow) encircles the umbra. Animation by Tom Ruen. 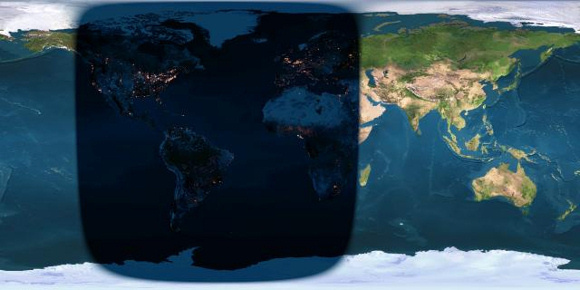 Day and night sides of planet Earth at the instant of the September 2015 full moon (2015 September 28 at 2:51 Universal Time). You have to be on the night side of Earth to see the moon at the instant that it turns full, at which time it’ll be totally eclipsed by the Earth’s dark shadow. When is the September 2015 moon exactly full? Generally speaking, we can say the moon stays full all night on September 27-28. But, to astronomers, the moon turns full at a well-defined instant: when it’s opposite the sun in ecliptic longitude. That instant happens on September 28, 2015 at 2:51 UTC. At our U.S. time zones, that places the precise time of full moon on September 27 at 10:51 p.m. EDT, 9:51 p.m CDT, 8:51 p.m. MDT or 7:51 p.m. PDT. At that time, because there’s an eclipse happening, the moon will be totally submerged in the Earth’s dark umbral shadow. Meanwhile, because of the difference in time zones, this same full moon happens around local midnight (September 27-28) for Brazil and Greenland. 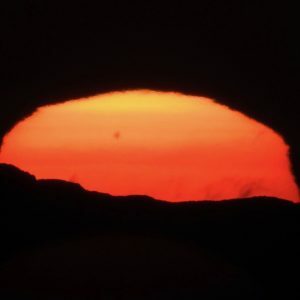 It’s sunset (September 27) for far northeastern North America and it’s sunrise (September 28) in far-eastern Africa, the Middle East and European Russia. Watch the full-looking moon on the night of September 27-28 to rise in the east as the sun goes down. Like any full moon, the Northern Hemisphere’s Harvest Moon will shine all night long. It’ll soar highest in the sky around midnight and will set in the west around sunrise. View larger A lunar eclipse happens when the Earth, sun and moon align in space, with Earth in the middle. Why aren’t there eclipses at every full and new moon? Who will see the September 27-28 total lunar eclipse? The September 2015 full moon passes directly through Earth’s dark (umbral) shadow. The total part of this eclipse lasts for 72 minutes. A partial umbral eclipse precedes totality by some 64 minutes, and follows totality by about the same period of time, so the moon takes about 3 and 1/3 hours to completely sweep through the Earth’s dark shadow. North America, South America, the Atlantic Ocean, Greenland, Europe, Africa and the Middle East are in a good position worldwide to watch the total eclipse of the moon. If you live in the Americas, the total eclipse happens after sunset September 27. In the world’s eastern hemisphere, the total eclipse happens after midnight and before sunrise September 28. 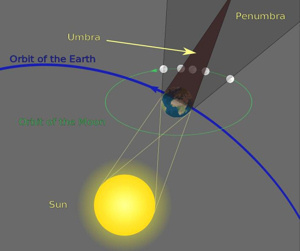 A very light penumbral eclipse comes before and after the dark (umbral) stage of the lunar eclipse. But this sort of eclipse is so faint that many people won’t even notice it. The penumbral eclipse would be more fun to watch from the moon, where it would be seen as a partial eclipse of the sun. Who will see the partial lunar eclipse on September 27? A partial lunar eclipse may be visible in the haze of evening dusk on September 27 from the extreme northwestern portion of North America (western Alaska). A partial lunar eclipse might also be observed in the haze of morning dawn (September 28) from far-western Asia (Pakistan, Afghanistan, eastern Iran). View larger. 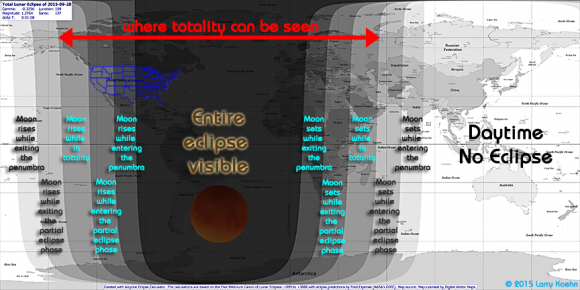 Image, courtesy of Fred Espenak at EclipseWise.com. P1 = beginning of penumbral eclipse, U1 = beginning of partial umbral eclipse, U2 = beginning of total eclipse, U3 = end of total eclipse, U4 = end of partial umbral eclipse, U4 = end of penumbral eclipse. 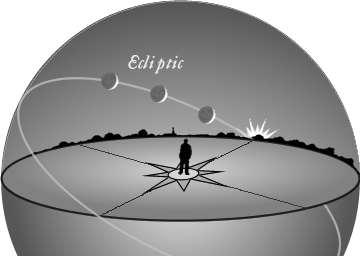 In autumn, the angle of the ecliptic – or sun and moon’s path – makes a narrow angle with the horizon. Image via classicalastronomy.com. 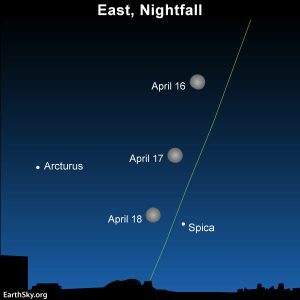 The narrow angle of the ecliptic means the moon rises noticeably farther north on the horizon, from one night to the next. So there is no long period of darkness between sunset and moonrise. Image via classicalastronomy.com. How is the Harvest Moon different from other full moons? The Harvest Moon is the full moon falling closest to the autumn equinox. In the Northern Hemisphere, it usually falls in September, although it can come as late as early October. In the Southern Hemisphere, a full moon with Hunter’s Moon characteristics comes in April or May. Autumn full moons – like the Hunter’s Moon or Harvest Moon – are different from other full moons. That’s because, in autumn, the ecliptic – or path of the sun, moon and planets – makes a narrow angle with the evening horizon. That fact causes several sky phenomena. For example, the location of the moonrise on your horizon, for several nights around a Northern Hemisphere autumn full moon, is noticeably farther north along the eastern horizon for several nights in succession. It’s this northward movement of the moon along the eastern horizon at moonrise – for several days in a row, around the time of full moon – that gives the Harvest Moon its magic. These more northerly moonrises assure us of earlier-than-usual moonrises around the time of full moon. On average, the moon rises 50 minutes later daily. But at mid-northern latitudes around now, the moon is rising about 30 to 35 minutes later. And farther north, the effect is even more pronounced. For instance, at latitudes close to the Arctic Circle – like at Fairbanks, Alaska – the moon actually rises around 15 to 20 minutes later for several days in a row. Meanwhile, in the months of September, October and November as seen from the Southern Hemisphere, it’s springtime. In the spring, there is a particularly long time between successive moonrises, around the time of full moon. Before the advent of electricity, our ancestors knew how to plan nocturnal activity around the full Hunter’s Moon. If you live sufficiently north on the globe, you can count on tonight’s Hunter’s Moon to bring early evening-till-dawn moonlight for the next several nights! As autumn full moons, the Harvest and Hunter’s Moons show this seasonal effect, though to a lesser extent than usual around now due to an effect known as minor lunar standstill. Bottom line: The 2015 Harvest Moon takes place on the night of September 27-28 for us in the Northern Hemisphere. The Harvest Moon, which is the full moon closest to the September equinox, is characterized by a shorter-than-usual time between moonrises for several nights in a row around full moon. This September 2015 full moon features the fourth of four total lunar eclipses in the ongoing lunar tetrad. Thus this eclipse will be called a Blood Moon.